The inspiration for this photo-shoot came from the idea of a bright, clean, elegant, spring dinner party. We like to entertain in our own home and love the idea of bringing people together to enjoy a nice meal. It may be stressful organizing an event or dinner party, but we are here to tell you that it can be simple to pull together an elegant setting. All you need is some quality table linens in your favourite shade and some florals. We love the elegance that the bright colour combos provide, so simple greenery seemed the right choice for this setting. 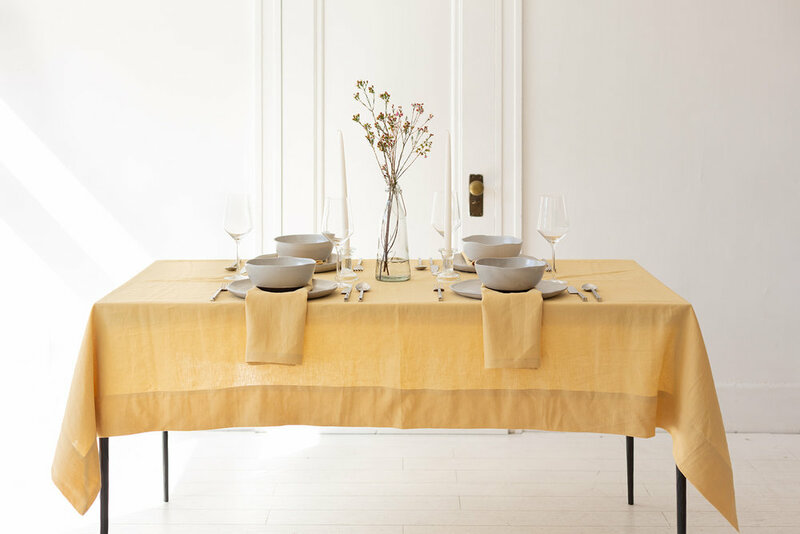 We chose clothing pieces that suit our new SS19 table linen colours: clay and cornsilk. Natural linen is always a good pairing! Elise wears a monochrome outfit with the Dahlia Tank and our new Marigold Pant. And if you are feeling a little fancier, we styled the Oasis Dress in dove gray - Stunning with some silver jewelry from Sarah Mulder. Sydney exudes luxurious comfort by dressing up her favourite pair of leggings (we know you all have them) with the Orchid Tunic in light brown and for those who want a little more colour in their lives, the Poppy Tank Tunic in Sea Green. Serenity West strives to keep things natural and simple, yet luxurious. That was the goal with this spring dinner party. As you know, we also like to support local and support fellow female creators. We sought out one of our favourite jewelers and ceramicists in Vancouver to help us create such beautiful settings, with our go-to makeup artist as well. Dream Team!